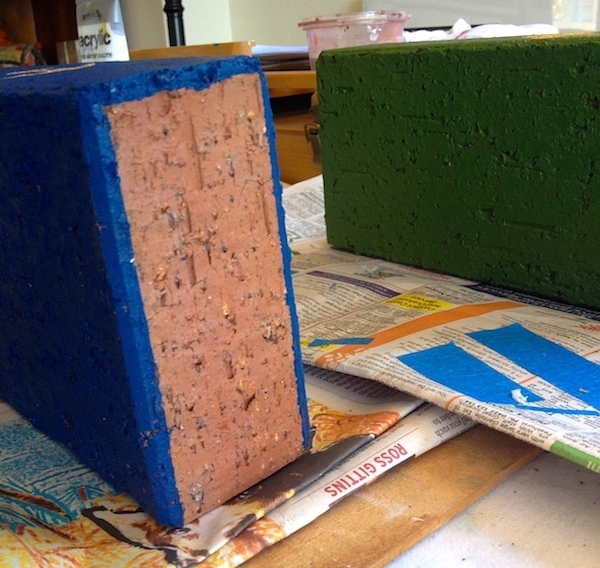 My due date was two days ago, but I’m not complaining since I only just finished my final nursery craft project yesterday: a pair of bookends made from bricks. Like other craft projects, this one wasn’t original. 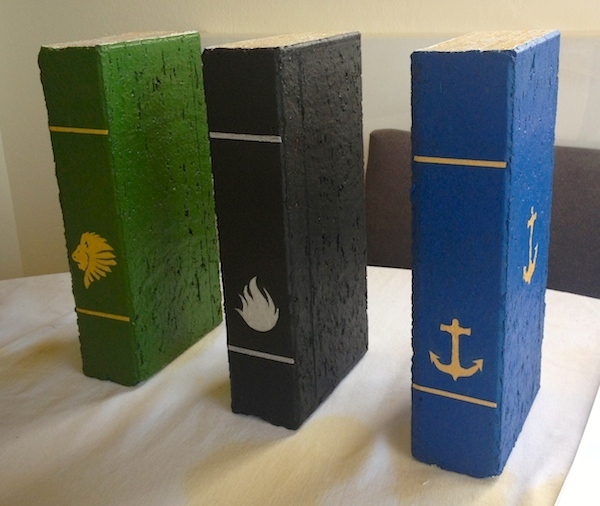 You can watch a video on how to make brick bookends here and below are a few photos of different projects I found online. 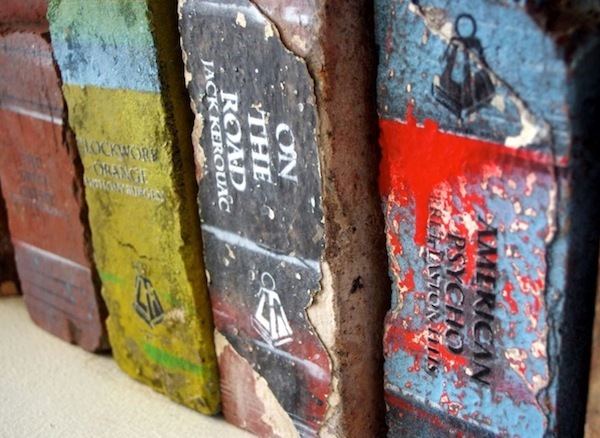 Each project has its charm, though the bricks are transformed into books with varying degrees of realism and flair. 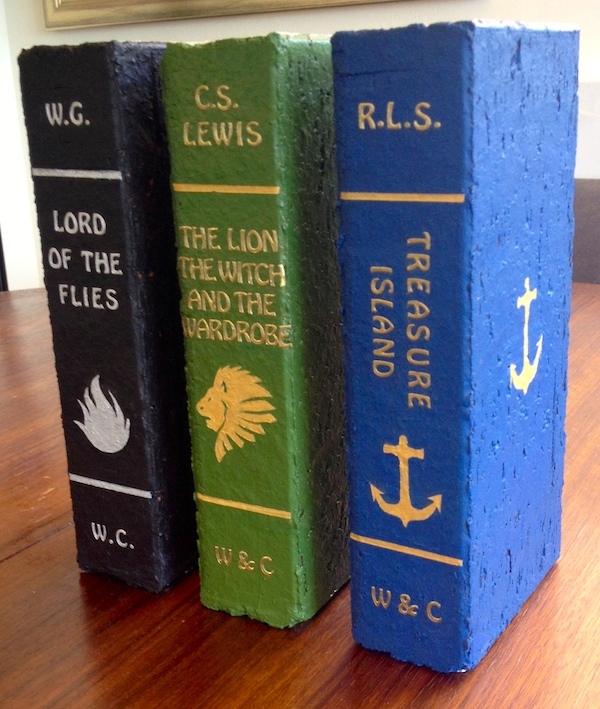 One Australian guy seems to have made a successful business out of producing brick bookends. 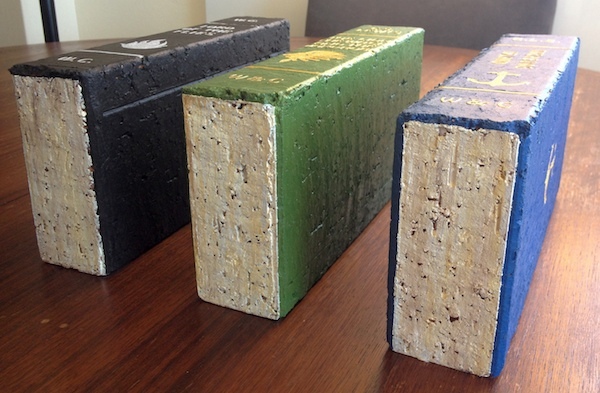 The Melbourne-based company, Light Reading, produces brick books with the use of stencils (it seems). Some of the Light Reading creations look more realistic than others. And some are decidedly more artistic and inspired in their design: proper works of art. 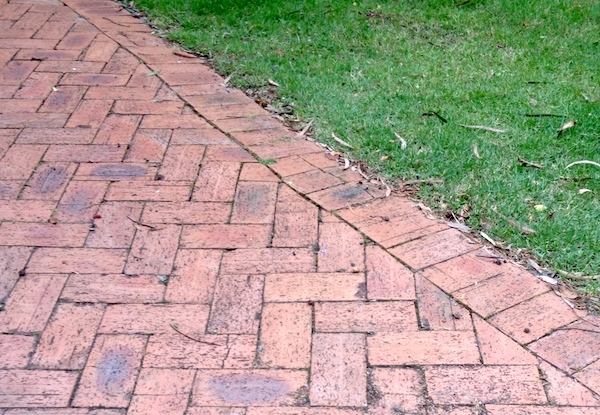 The quality and defects of the brick clearly help shape the end result in the most successful pieces. But you still always know that they’re bricks somehow. I’m not sure how much Light Reading charges for its bricks (before shipping) but I doubt any price would entice me to buy something I could make myself. 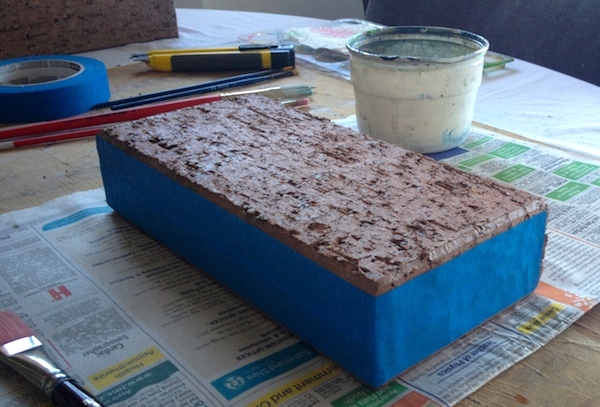 It’s just a brick, after all, though in some instances, gorgeously transformed. Of course, this project would only make sense to me if I already had the raw materials required to complete it. To my great fortune, my mother-in-law had her front driveway partially re-paved a few years ago. 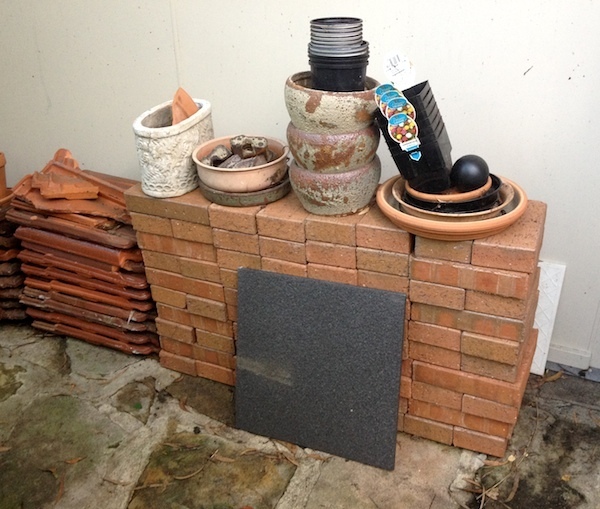 And had 80-odd pavers left over that sat forgotten behind her car port. I didn’t bother cleaning the bricks. They were still in almost pristine condition, so had a new look about them which already dictated that I would have a cleaner, neater end-product. 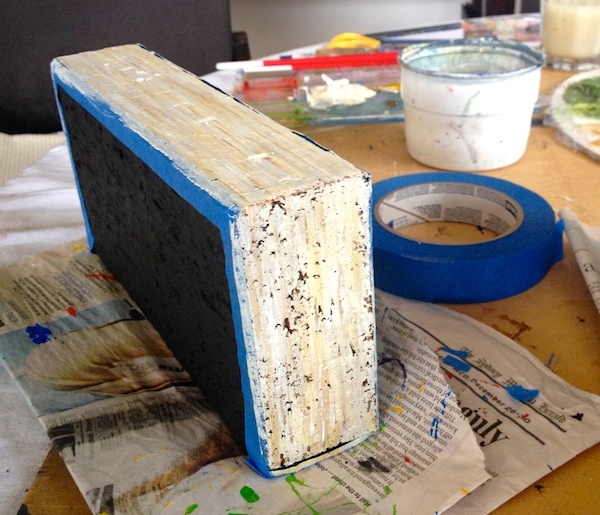 Once the ‘book cover’ was dry, I re-applied tape to paint the ‘pages’. I asked my husband what children’s book titles he preferred, and he offered Treasure Island. 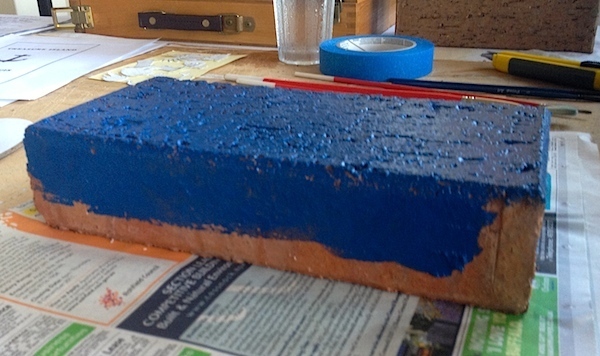 I decided my blue book would make the best Treasure Island – a purely coincidental replication of one of the Light Reading bricks above. 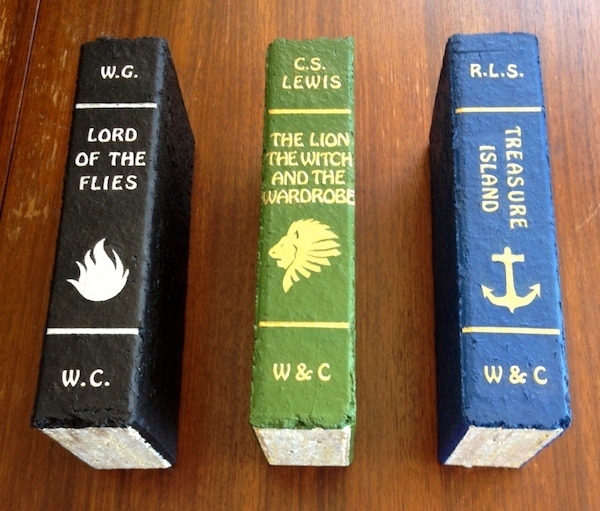 For my other two titles, I chose Lord of the Flies (to be in black) and The Lion, the Witch and the Wardrobe (to be in green). Before applying the text along the spines, however, I decided to create thematic symbols for each title. 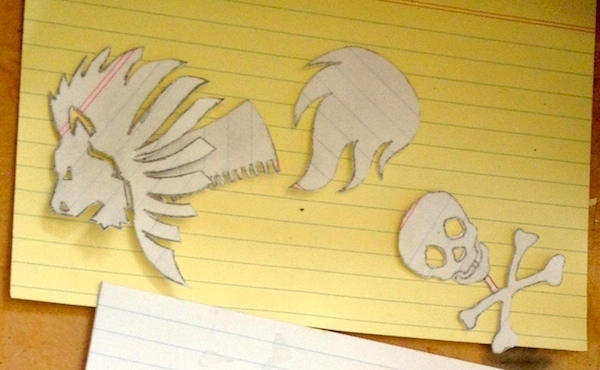 After a quick search for the right clip art, I made simple reverse stencils from index cards. 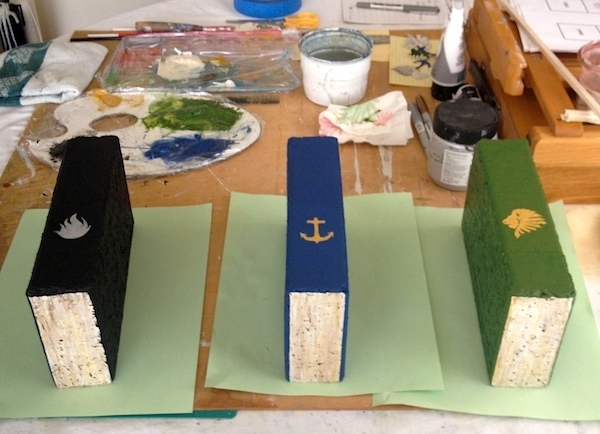 After painting a block of gold or silver along the spines, I applied the reverse stencils and repainted over the entire area in the book cover color, leaving only the gold or silver behind the stencil remaining. With the aid of painter’s tape, I painted simple lines along the spines as well. 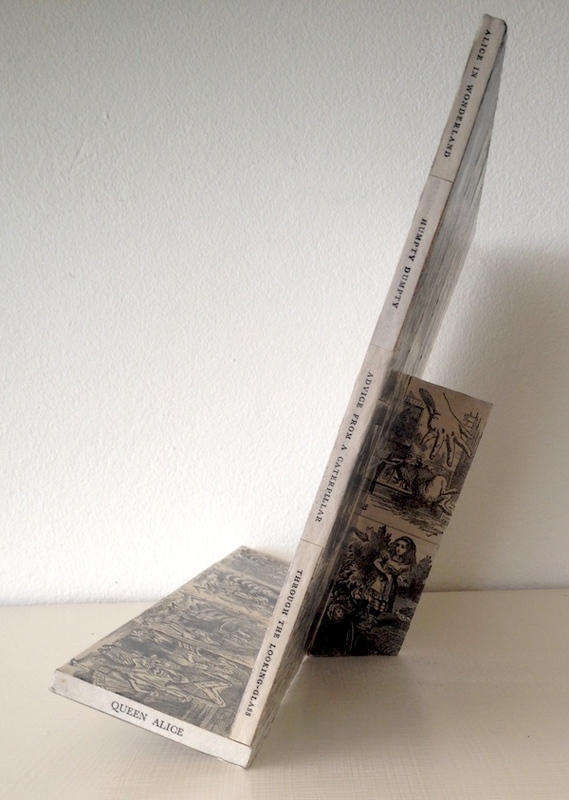 Only one brick received any special treatment to its front cover though. After applying the larger anchor to the cover of my Treasure Island book, I decided that I wouldn’t attempt to do more to any of the covers. I just couldn’t be bothered. At this stage, I was delighted with my brick books, their degree of realism, the simplicity of the design and the ease of the project. Things got a lot harder, however, when it came to considering the text. I initially tried to handwrite the text with gold and silver markers and my husband wasn’t impressed. I admit that the results were sub-optimal. That I was writing with the swollen, stiff and painful hands of a pregnant woman post-term didn’t help. 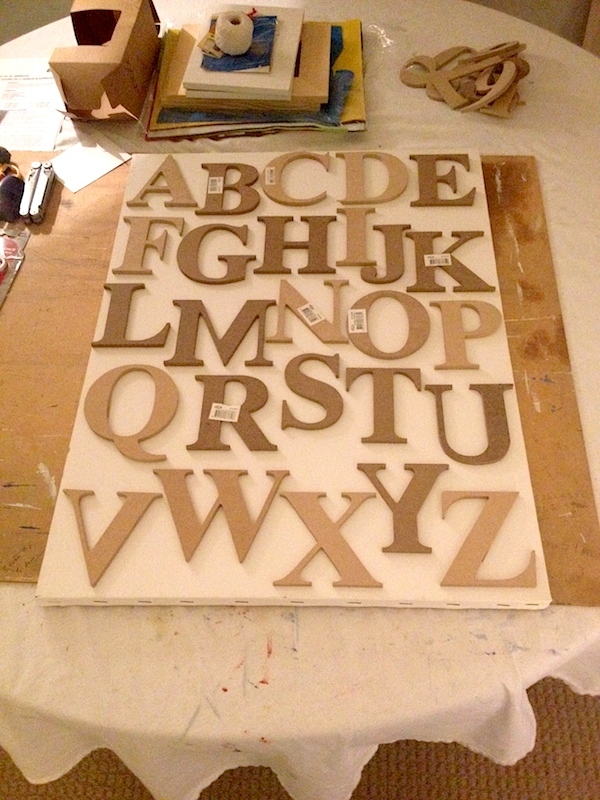 Next, I tried to find an alphabet stencil small enough to paint the text, letter-by-letter, but I couldn’t find anything in the local stores and didn’t want to order anything online and wait for it to ship. I even tried to create a stencil by printing text on card stock and painstakingly carving the letters out with an Exacto knife. That was a tedious exercise in failure. 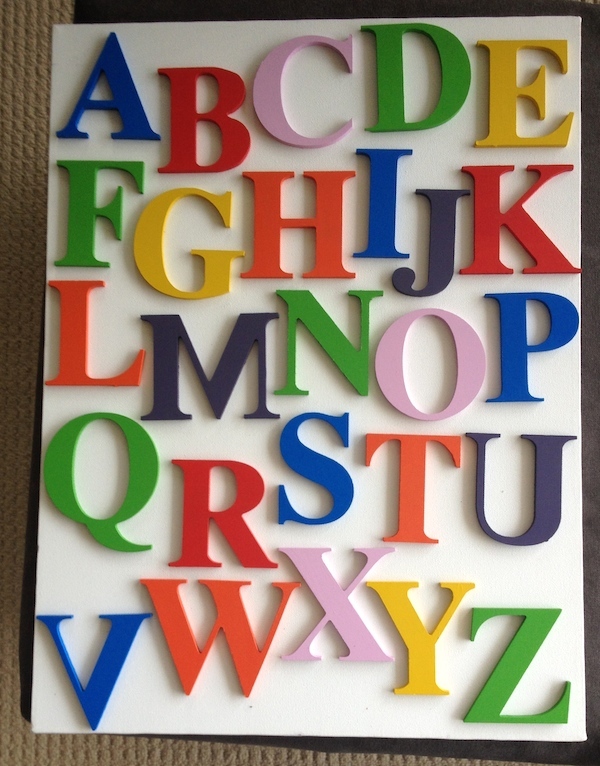 I finally had to settle for gold alphabet stickers and found only one kind that could work. I was limited by the font, and the letters could have been slightly smaller, but I’m pretty happy with the result. 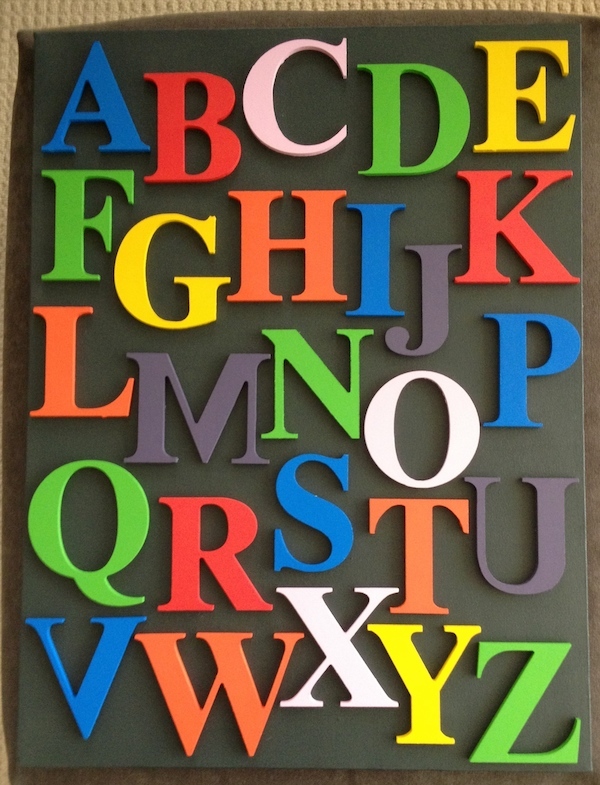 I had to settle for the authors’ initials at the top because the letters were too large. The initials at the bottom represent the faux publisher, the first letter of my husband and my surnames. 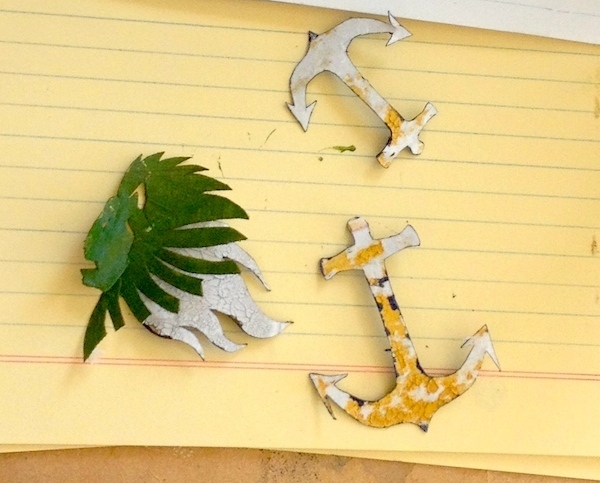 As I only had gold adhesive letters, I painted them silver for Lord of the Flies with a liquid silver pen. One bookend was all that was needed for the windowsill. 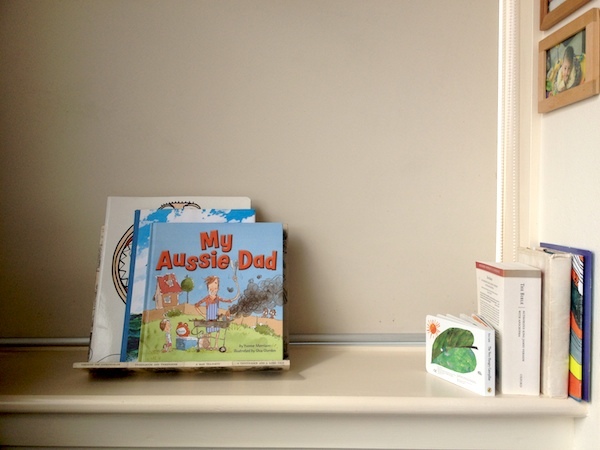 And the other two will hold a few books on top of the chest of drawers. So now my work is done! 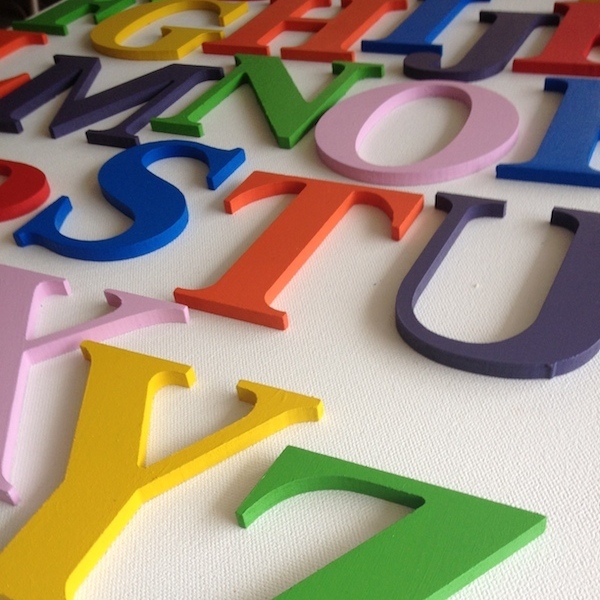 No more nursery craft projects to complete before the baby is born. Of course, I’m two days over due already, and my doctor won’t induce labor until I’m 12 days overdue. 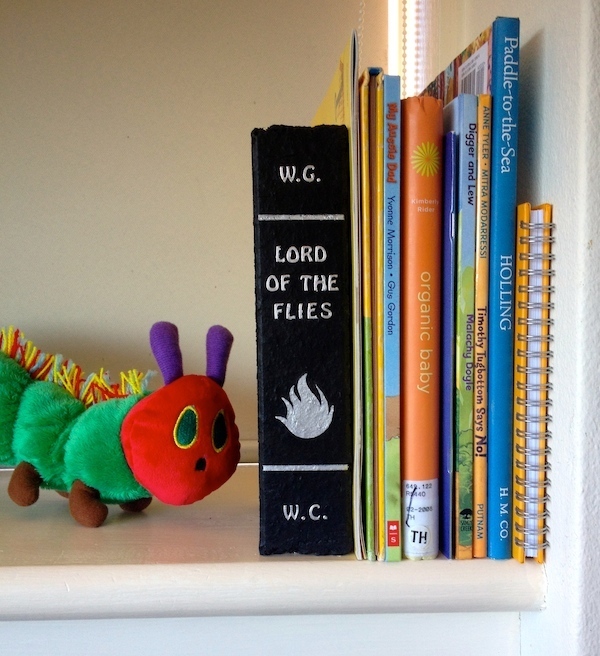 Perhaps a newborn doesn’t have much use for children’s books. 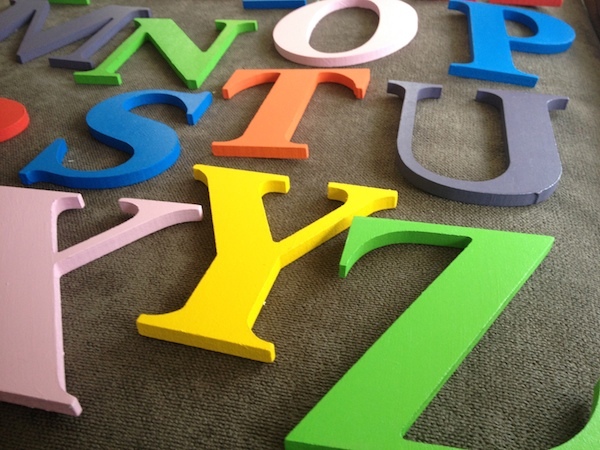 Still, it’s never too early to start building a child’s library and nurturing the habit and pleasure of reading. 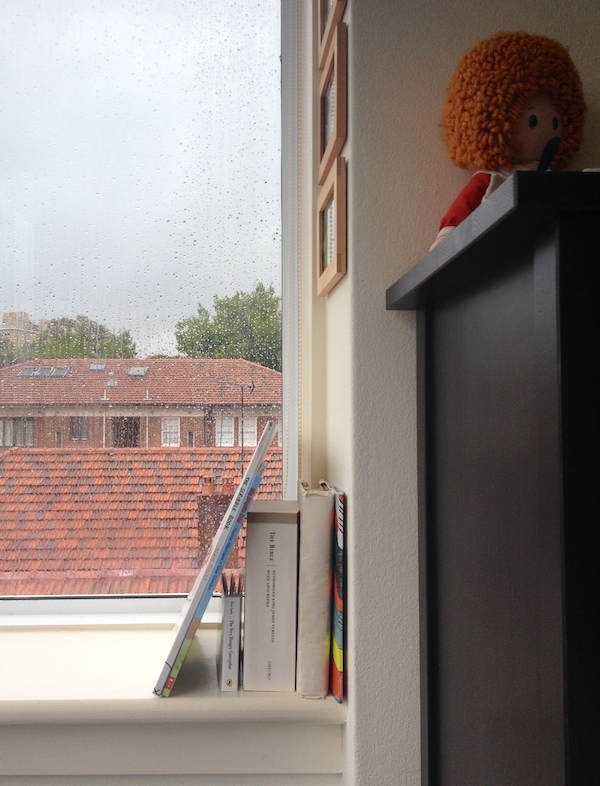 A look at the two oversized children’s books leaning inelegantly against the smaller ones on my window sill, however, made me reconsider how to display the larger books. I’m a huge fan of displaying children’s books with their covers face forward, rather than their spines, but it only works with large expanses of wall (or tiny collections). 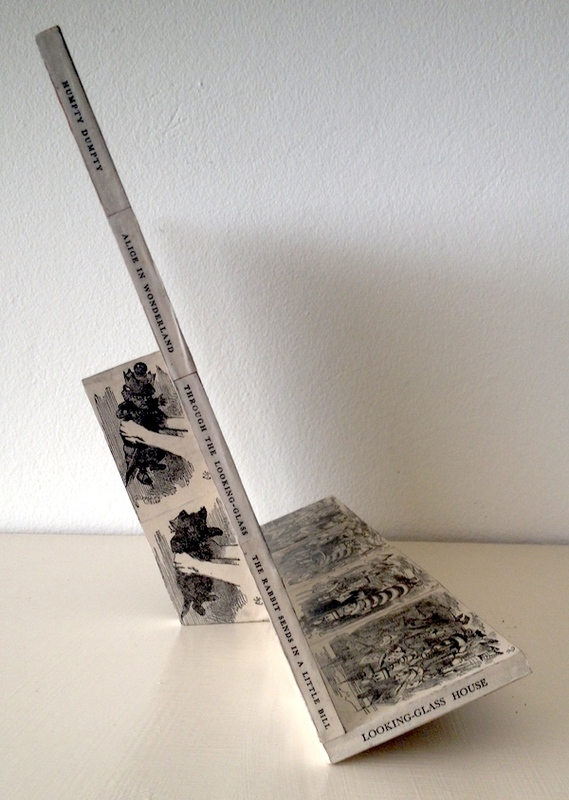 A single lectern, on the other hand, allows the display of a few large picture books in a small space. 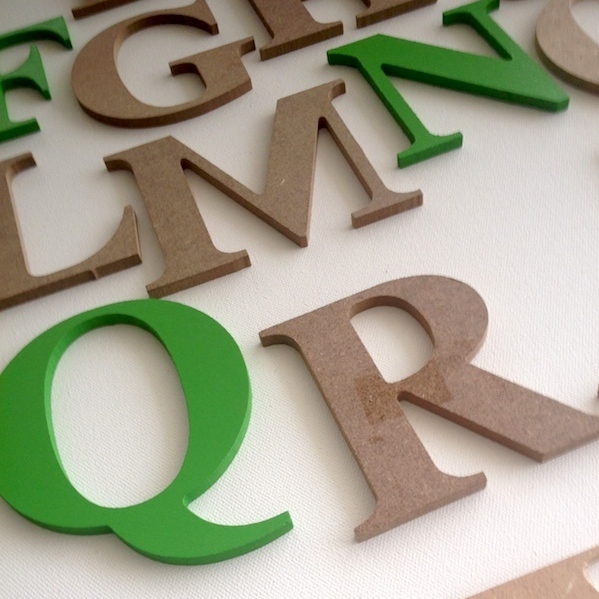 Settled on making a lectern, I was determined to make use of any scrap wood or MDF that I already owned. For so small a project as this, I refused to spend any money on materials. 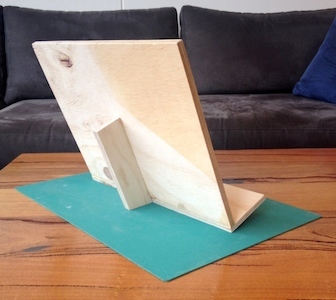 I used the largest piece of scrap plywood I had as a back rest, and cut two smaller pieces to act as a base and easel. 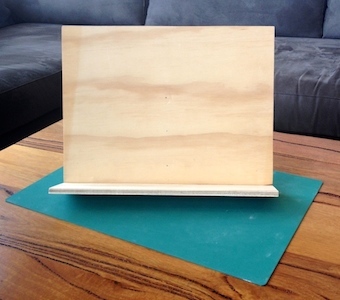 I joined the plywood with PVA wood glue and reinforced it with nails. The entire construction took a matter of minutes, and I couldn’t have been more pleased with the result. That left the question of how to decorate the thing. Paint it? A solid colour? Stripes? Too boring. Cover it? With a paper collage? I liked that idea. But what kind of paper? Newspaper? We don’t buy print newspapers anymore. Comic book images? Not my Buffy. No siree. Nu uh. (And not age-appropriate anyway.) 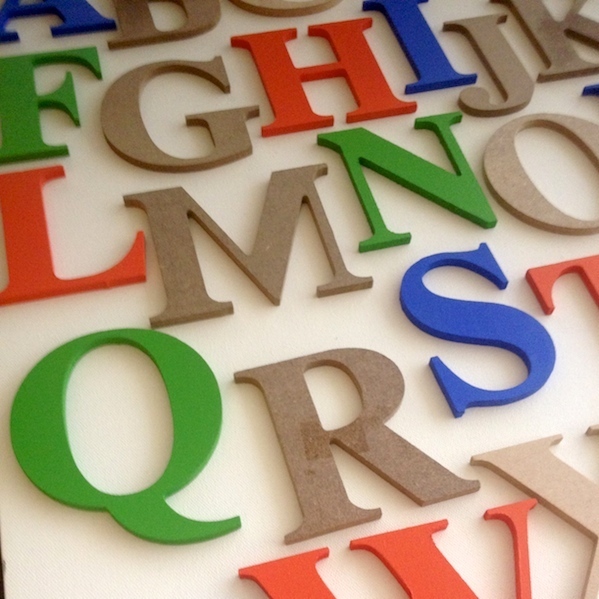 Dictionary pages? Could have worked, but I didn’t have an appropriate dictionary I was prepared to cut up. 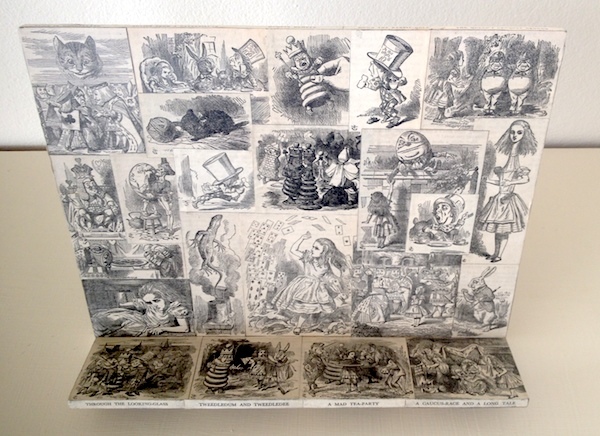 Pages from a children’s book? Last year I made my mother-in-law a book cover collage from the duplicate and battered copies of classics in her extensive library. I knew I was right to keep the books after I’d used the covers. 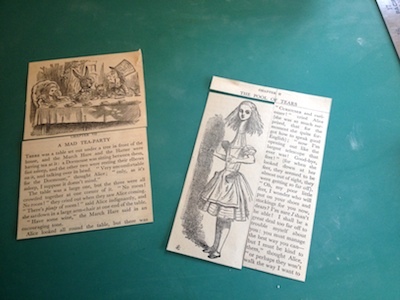 I was bound to find a use for them at some point, and the yellowed, crumbling pages of an old edition of Alice in Wonderland was just what I needed. 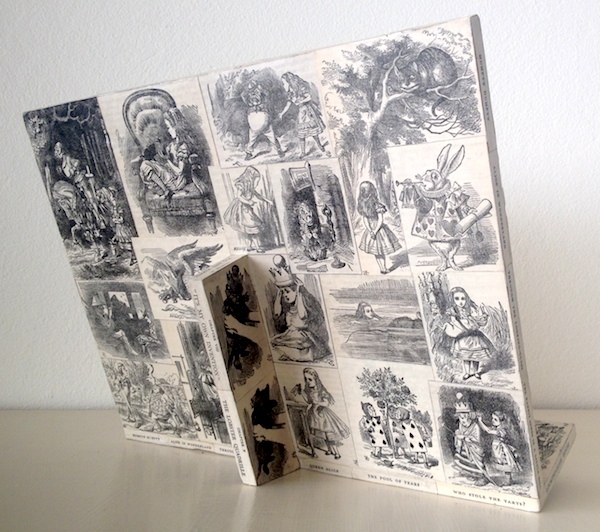 I’d initially thought to use the full pages with text and illustrations, but abandoned the idea of using text altogether with so many provocative illustrations at my disposal. For the edges I cut out chapter titles. This project was a simple cut and paste job with a layer of Mod Podge brushed over the surface to seal it. But arranging the images to fit and overlap well was surprisingly time-consuming. 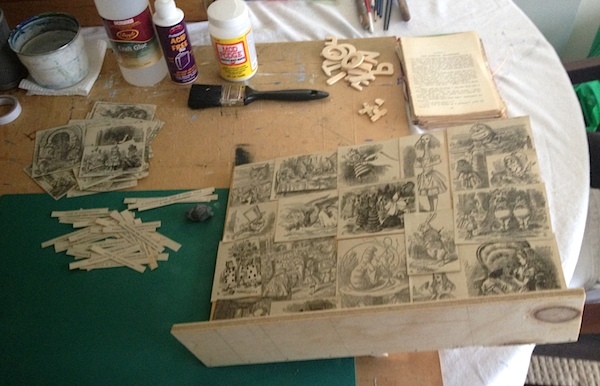 For that reason, I was sorely tempted to just paint the back and the bottom of the lectern… or cover it with felt… or leave it unfinished… or do anything other than cover it with more illustrations. But I relented and tackled the back and bottom as well. This enables the lectern to be displayed at any angle, after all. So very little of my collage is actually visible. At more than 38 weeks pregnant, I’m still on a craft tear, but the clock is ticking for me to wrap up my nursery projects. 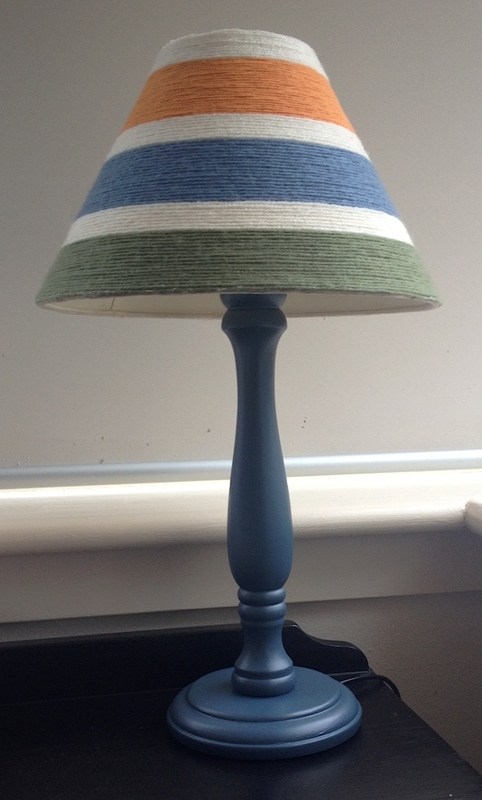 A lamp makeover was hardly necessary, but my husband kept complaining about my bedside lamp for some reason. I never really minded it, but it was quite plain. 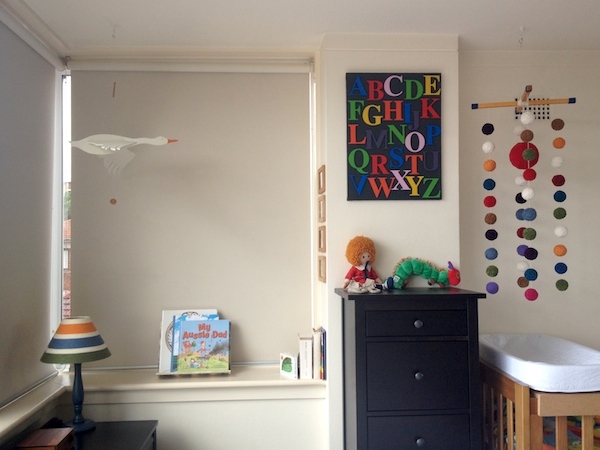 Moreover, it encroaches on the beginning of the nursery wall in the bedroom that we’ll share with the baby, so it could benefit from a bit of color. 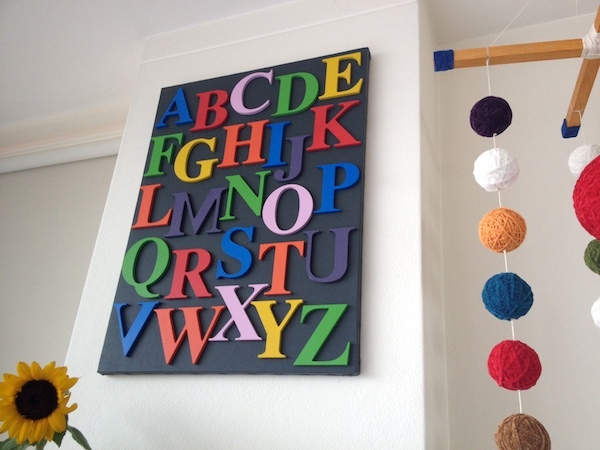 As per usual, this project was only going to satisfy me if I could make use of materials that I already owned; and seeing as I had heaps of yarn left over from my nursery mobile, I resolved to use it. 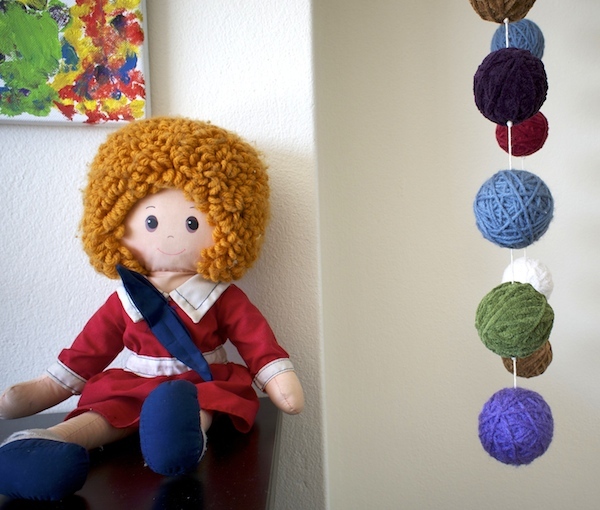 Besides, a second yarn-related piece in the room would better ground the nursery mobile in the space, and provide further texture for a cozier atmosphere. 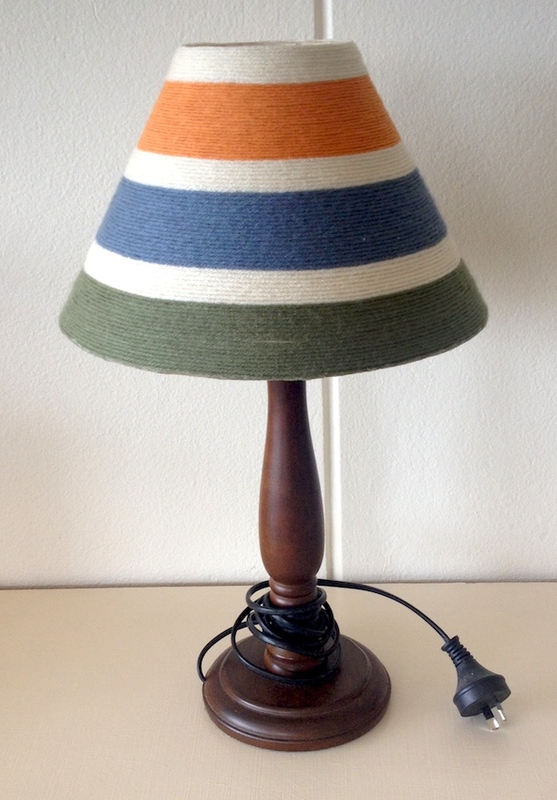 Painted bases and 3-toned horizontal bands of yarn were clearly the trend, and the shift from one colour to the next was universally handled with alternating stripes for added interest. I really hate being trendy, but I’m not so delusional or arrogant as to think that I’m immune from the influence of popular design aesthetics. I like the look of the shades, I admit. Would I have liked the shades ten years ago when they weren’t on trend? Who knows. But I was determined to mix things up – at least a bit – with my shade. I don’t like the way the lamp bases are painted however – at least not the white ones. I’ve remained happily immune to the so-called ‘charms’ of painted white furniture, but you’ll find it everywhere and especially in nurseries. People seem to think that white paint makes furniture look ‘fresh’. But I think it makes it look cheap, with some exceptions. Like past projects, this one was fun for the challenge of using pre-owned materials. 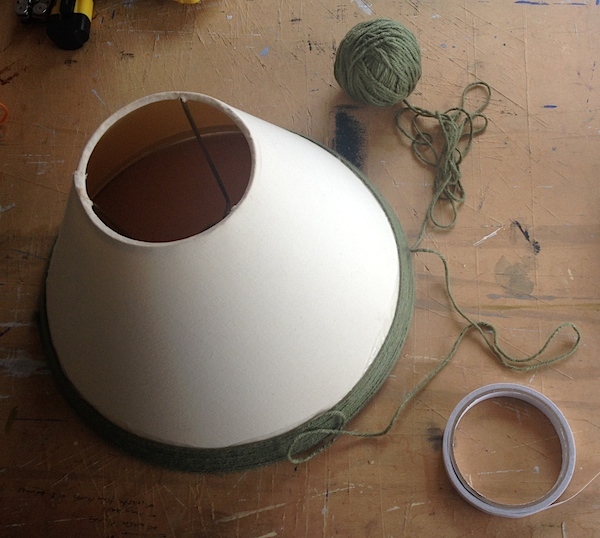 I was limited in the colours of yarn I could use, and I was forced to work with a lamp shade with a much sharper angle, such that the yarn almost never stayed in place as I wrapped it around the shade. In the end, I resorted to using double-sided tape for every row, which worked like a dream. 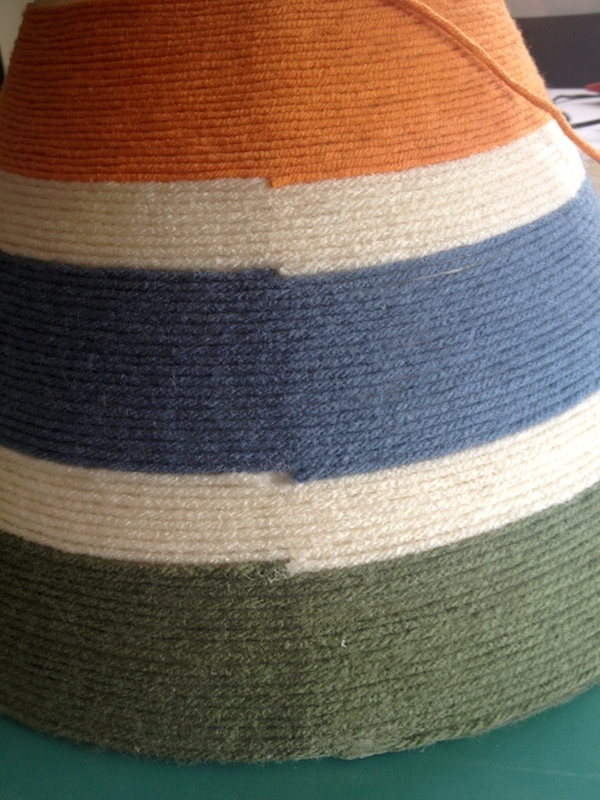 I just stopped with one colour when it felt right, and switched to another, being mindful to start and stop along the shade’s primary seam. A dot of craft glue was used at the tips. While the double-sided tape worked wonders as I went up the shade, the very top and bottom rows never did stay put without a final line of glue. But in the end, the shade looked surprisingly tidy. 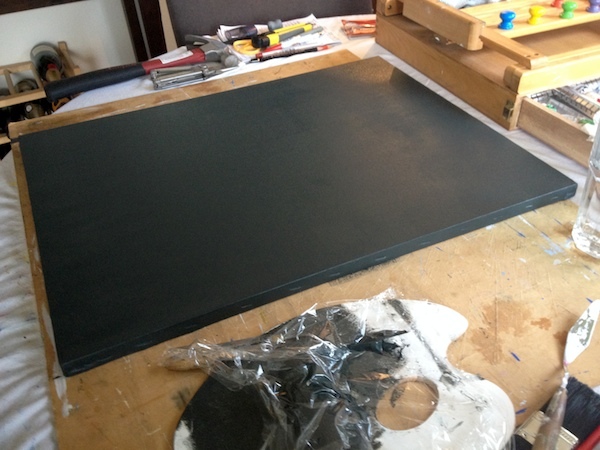 I was happy at this stage to call the project done, but my husband felt the base needed a coat of paint. 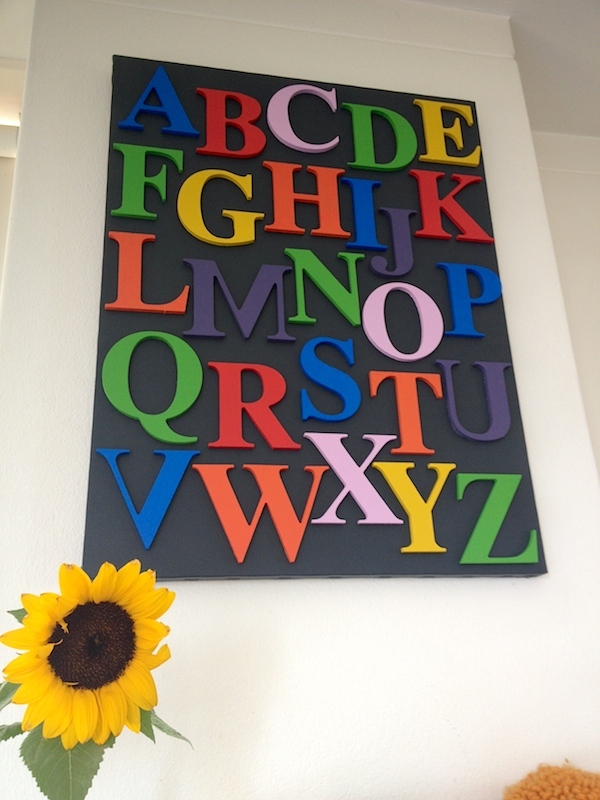 Curiously, he suggested a dark grey – the very colour used in the example above – which he’d never seen. (That’s the strong and silent influence of trends for you.) But I’ve not been led astray in trusting his instincts yet. I’m still not convinced that the base needed painting, or that this was the best paint colour for it. And I acknowledge that the shade pattern is predictable. 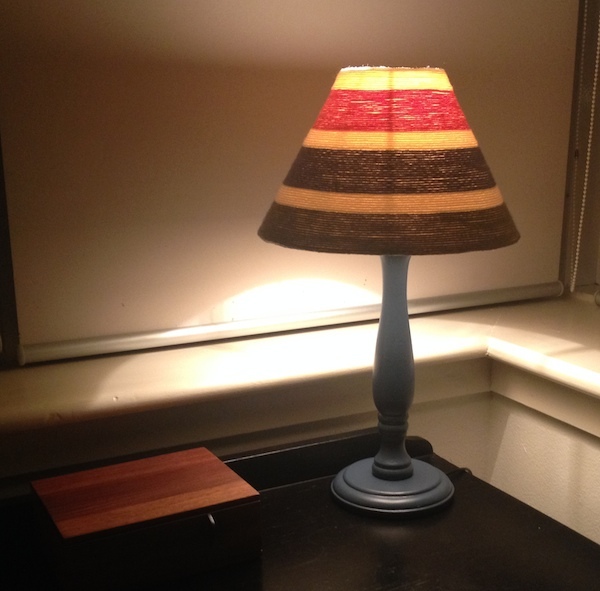 But I still like this lamp. 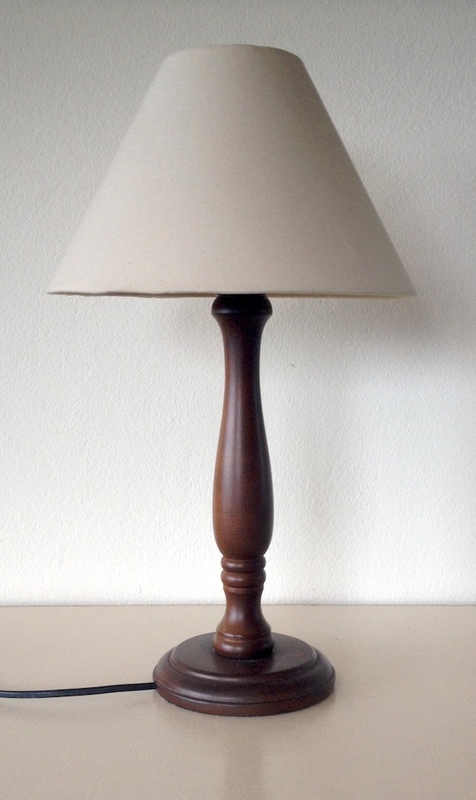 Of course, no one ever mentions or considers how these lamps will look at night, when the light is on. Meh. Not so great. 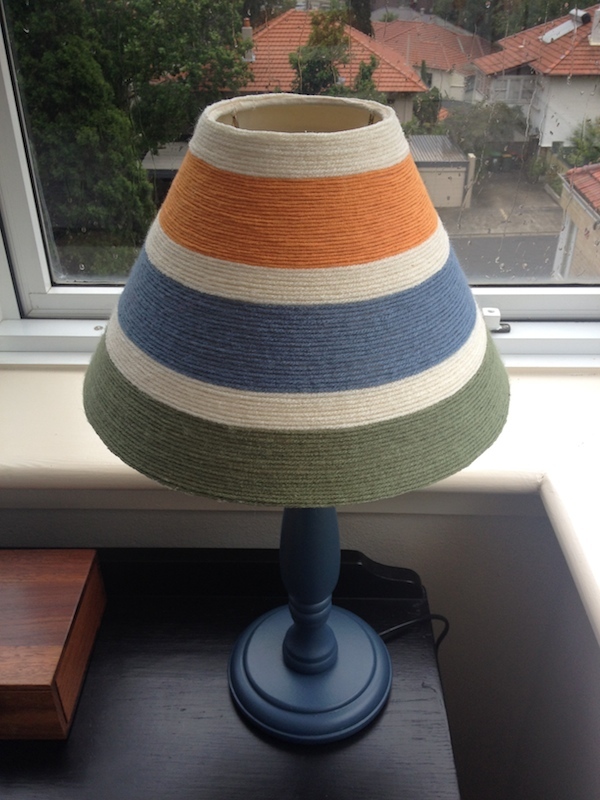 The light it gives off is pleasantly warm, but the lamp shade itself doesn’t look very nice with its colours so altered. But no biggie. In March I wrote a post about my weight loss on the 5:2 Diet. I lost seven pounds in three weeks on calorie restriction alone, and had every intention of continuing my experiment when something unexpected happened. Our baby is due in three weeks and we won’t discuss how much I weigh now. Sufficed to say, all weight loss experiments are on hold until December and I’ve shifted gears to more creative endeavours now that I’m officially on maternity leave. 2) Our bedroom will now have to harmonize the tastes of three different people to become something neither too adult nor too infantile. In other words, no cartoon choo choo trains on the walls, but no more muted colours either. After clearing the wall on my side of the room, I invested in the Grotime Turin Cot, a European space-saving crib considerably smaller than the standard, and bought an Ikea Hemnes Chest of Drawers to store our new roommate’s clothing and other bits and bobs. 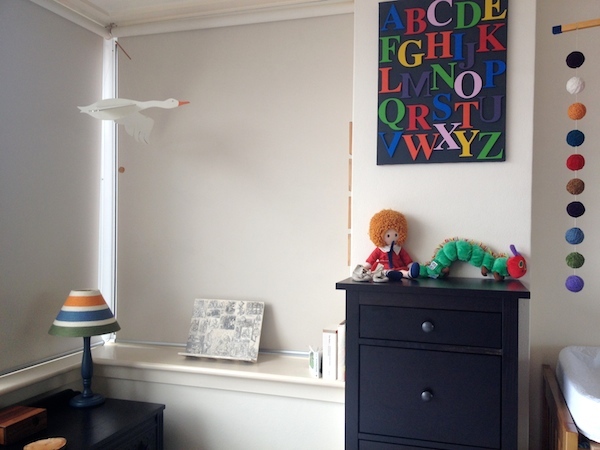 That leaves the fun but challenging task of decorating a baby’s space in a grown-up’s room. 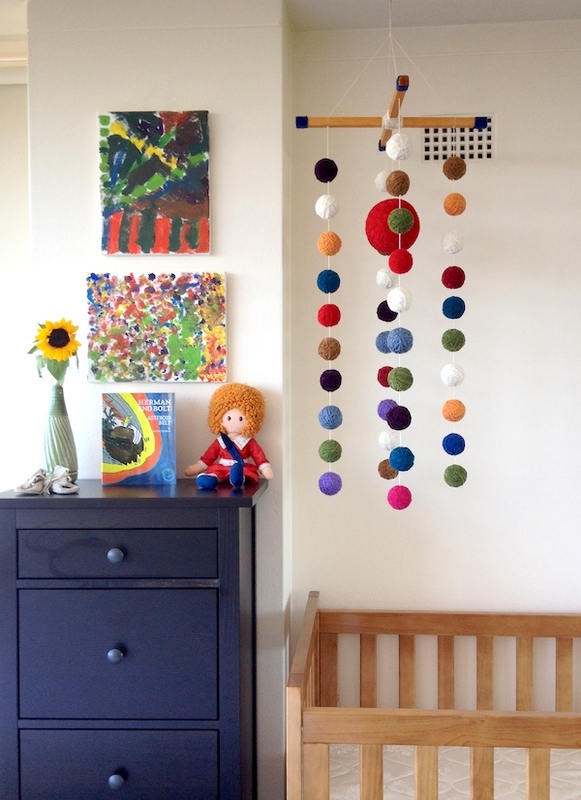 What better place to start than with a nursery mobile? So that was project number one. A quick search of nursery mobiles yielded lots of delicate and cutesy (but boring) examples; just as much garish and clichéd kiddy stuff; and a smaller number of DIY, crafty pieces of varying appeal. But one mobile featured on Pinterest stood out among the rest. 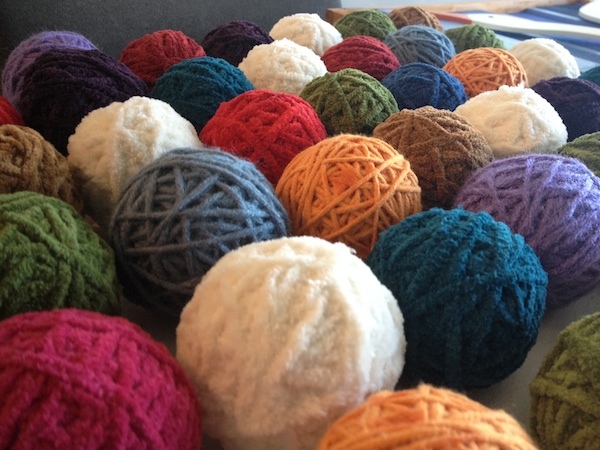 Glorious, simple, colourful yarn balls! 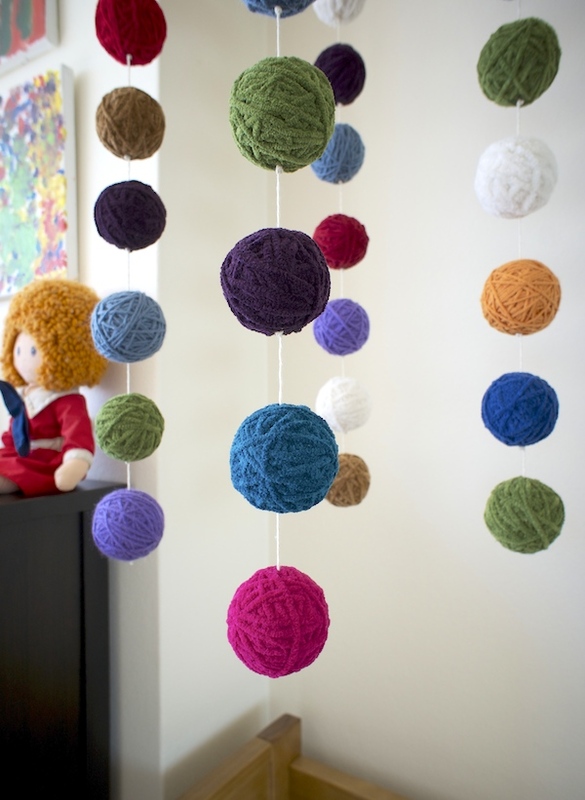 This one was deceiving, however, as it was more a long line of suspended balls of yarn than a proper mobile, and would not have worked nearly as well above a crib as it does in a brick-walled loft. 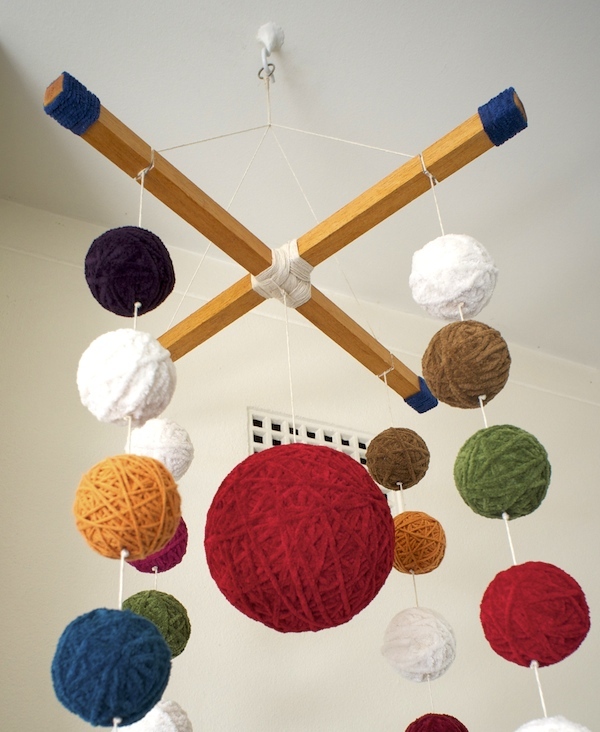 But the idea was a gem, and a Google search of “yarn mobiles” yielded plenty of other examples. Given my lust for upcycling, recycling, leftovers and used everything, I was delighted that I’d found a mobile whose materials I didn’t have to buy. I knew my mother would have plenty of scrap yarn from the crocheted hats and blankets she makes under the brand GaGa Originals. Which colours do I use? How do I make the balls? Do I make them different sizes or the same size? How do I hang the balls? How many balls on a string? How do they stay fixed on the string? What kind of string? What should the string hang from? How long and how wide should the whole thing be? In the end, I was fairly happy with my choices. But this project was more difficult to complete than it looks. Choosing My Colors. My mother sent me more colors than I ultimately used, and four different types of yarn. 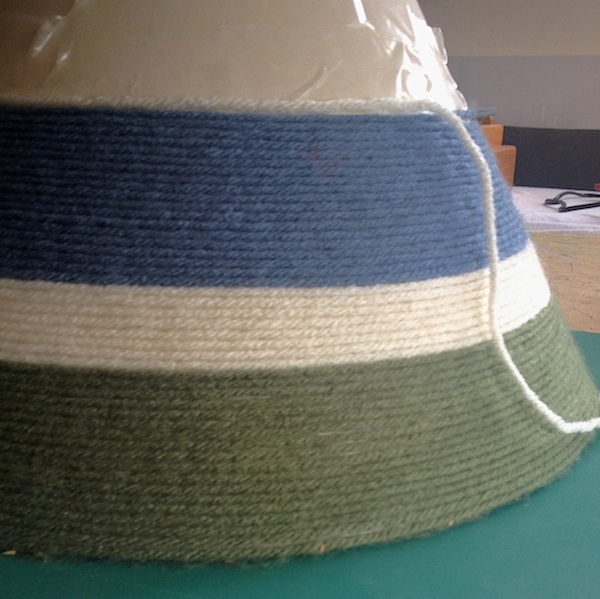 I had hoped to only use the Lion Suede, with its soft, velvety texture (see the green, for example), but I found the palette too limited as I didn’t have enough, so I was forced to use the coarser yarn as well. After spending several days(!) selecting my colors, I realised the palette was still wanting for lack of any orange. Reluctantly, I hit the craft store and bought a ball of orange yarn of an entirely different texture from everything else. 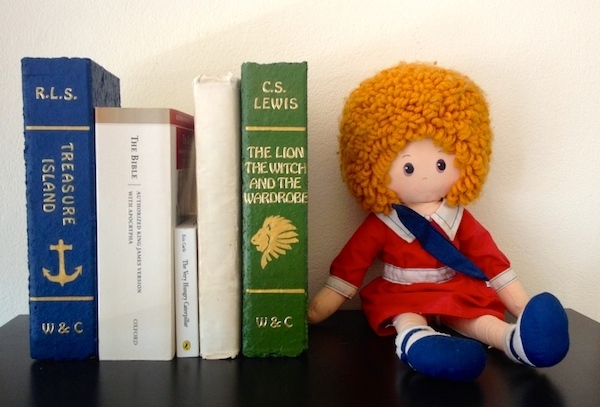 To my relief, it worked just fine and communicated nicely with the hair of my childhood Annie doll. 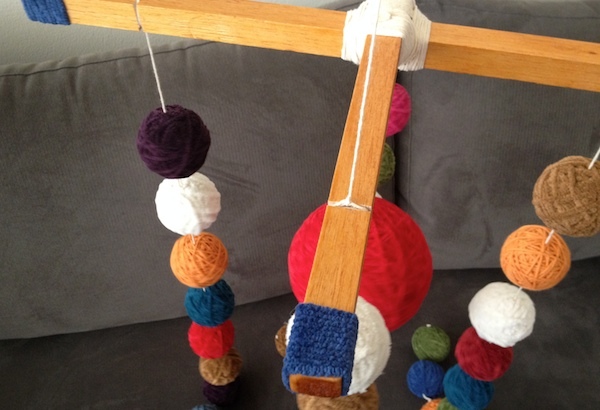 Creating the Yarn Balls. Having looked at a number of mobiles online that used balls of varying sizes, I decided the effect was interesting at the expense of elegance, so made all the balls the same size for my project. 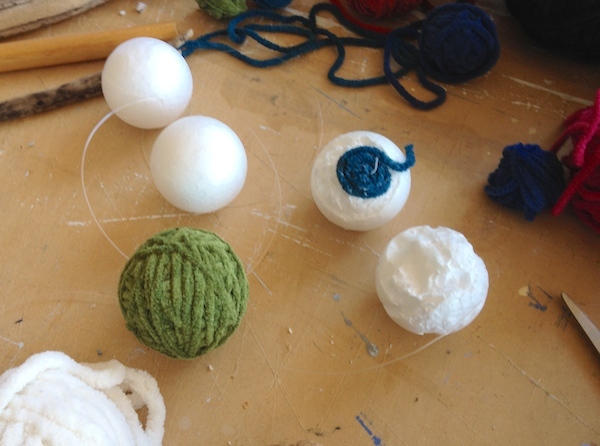 Most of the tutorials online involved randomly wrapping yarn into or on to a ball. 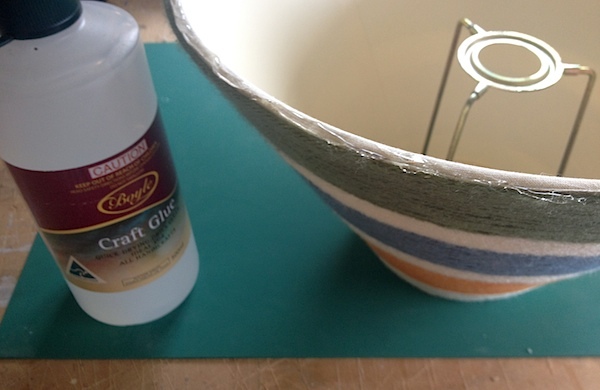 Only one tutorial advocated a single layer technique using glue. The effect seemed cleaner but proved impossible (for me) to execute. Threading the Balls. Initially I thought clear fishing wire would work best, creating a floating effect like in the brick-walled loft example. 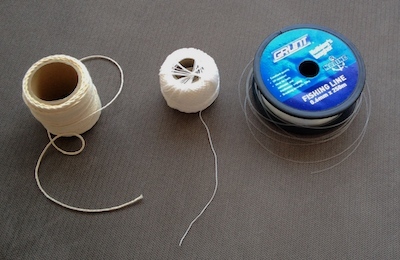 But my husband convinced me that it was an inappropriate mix of ideas and materials and that twine was a better partner to yarn than fishing wire or string. Threading the balls was easy enough with an extra-large (and long) sewing needle. Securing the balls on the string was as easy as tying a knot in the twine before the next ball was strung, leaving roughly 3 inches between each ball for symmetry. Suspending the Balls. Most of the mobiles online suspended the balls from one or more wooden rings. After initially trialling a single wooden ring, I decided it looked too nursery-esque, and opted for the equally traditional but edgier wooden cross. To create the cross, I chose the extremely lightweight material, balsa wood, which is remarkably easy to dent and score, but reliably strong. After staining the wood, I glued two pieces together, wrapped the centre in copious amounts of twine, and wrapped the four ends with blue Lion Suede. Before tying the strands of yarn balls to the cross, I scored its four sides where I planned to tie the strands. The addition of a large ball suspended from the middle was an afterthought when I realised the project still seemed to be lacking something. I have my husband to thank for the suggestion that it be red, a colour I generally dislike, but acknowledge has a particular vibrancy. The Finished Product. 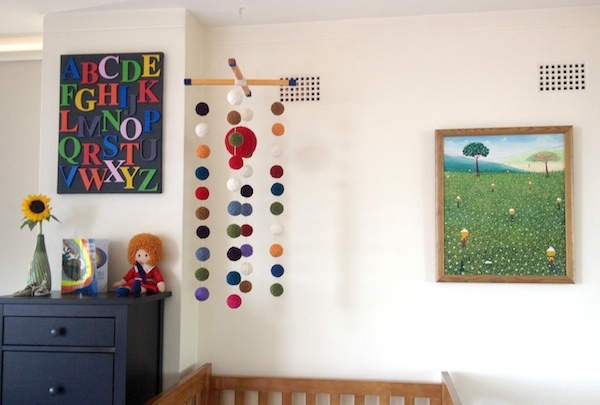 The end result is a mobile that I think can appeal to grown-ups and babies alike, with its simple forms, vibrant colour, different textures and nods to both traditional and contemporary elements. 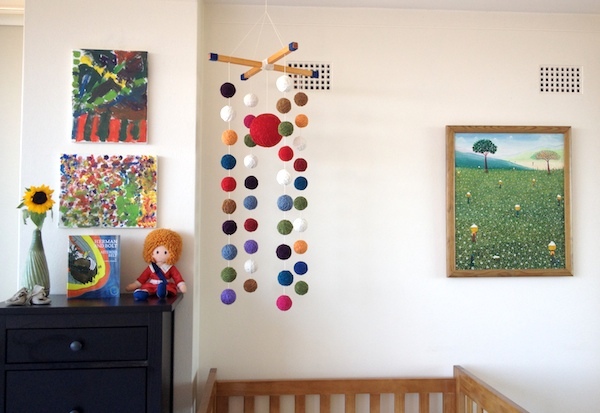 This mobile proves that art, craft and interior design need not be infantile to appeal to infants. There’s no reason that I know of why a baby would prefer a collection of cartoony stuffed elephants, half moons and owls hanging over his head instead of this. Completing the Space. 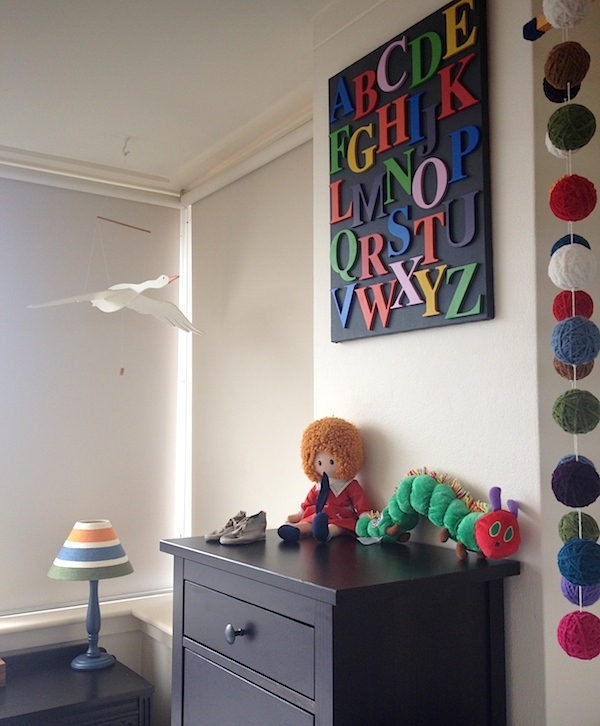 The abstract paintings on the nursery wall were painted by my two nieces a few years ago. They’re a bit too free-form to remain there, I think, but they’re fun place-fillers for a future project. 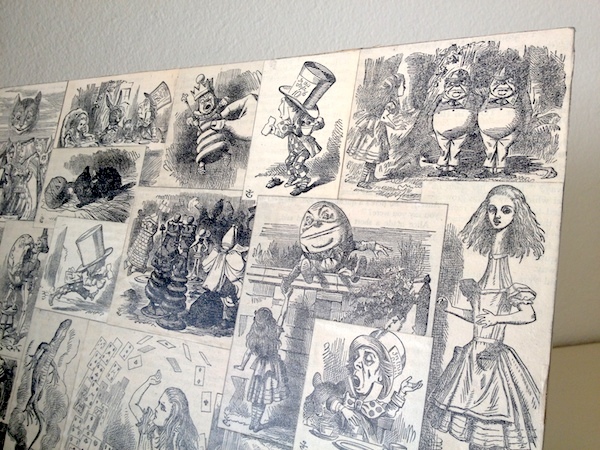 The children’s book was written and illustrated by a family friend and will move when I make a proper home for the baby’s burgeoning library. The baby shoes were my mother’s from the 1950s and will remain there. And the Ikea chest of drawers is begging to be hacked, as soon as I figure out how to embellish it. Whatever the final design, it will hopefully blend well with the rest of the room, while clearly defining the baby’s dedicated space. There’s still plenty to be done in terms of storage solutions, decoration and final placement of things. But I reckon my old Annie is there to stay.